T Andre Smith vs. Edge Derrick Morgan – With Jake Fisher out for the season, Smith is expected to take over at right tackle after rotating in at both tackle spots throughout the season. Smith’s 46.4 overall grade this season is the highest among the Bengals’ tackles but ranks only 53rd in the NFL. He’s allowed one sack, two hits and eight hurries on 116 pass-blocking snaps, and he’ll frequently face Morgan, who pass-rushes from the left side of the defense 97.2 percent of the time. He has five sacks, one hit and 21 hurries on 222 pass-rushing snaps, but his three total run stops this season is the second lowest among 3-4 outside linebackers with at least 100 run snaps. WR A.J. Green vs. CB Adoree’ Jackson – Green infamously lost his cool last week after being held to just one catch for six yards, but he still ranks third among all wide receivers with an average of 2.34 yards per route run this season. He’s dropped only one of his 40 catchable targets, but he’s only had two catches on deep passes on the season. Jackson leads his team’s cornerbacks with only 9.7 yards per catch allowed, but he also has the most penalties (6) and second-most missed tackles (7) on his defense. That has given him a 71.5 overall grade this season, which ranks 71st at his position. RB Joe Mixon vs. LB Jayon Brown – For the last two weeks, Mixon has seen the most passing snaps of his team’s running backs, firmly entrenching him as an all-around weapon for his offense. He has now caught 20 of his 21 total targets this season, picking up 221 yards after the catch. Both of his fumbles this season have come as a receiver, though. Brown has been the Titans’ nickel linebacker, dropping back into coverage on 73.3 percent of his total snaps this year. He’s been targeted 28 times this year, 16 of which came against running backs to whom he’s allowed nine catches for 121 yards. 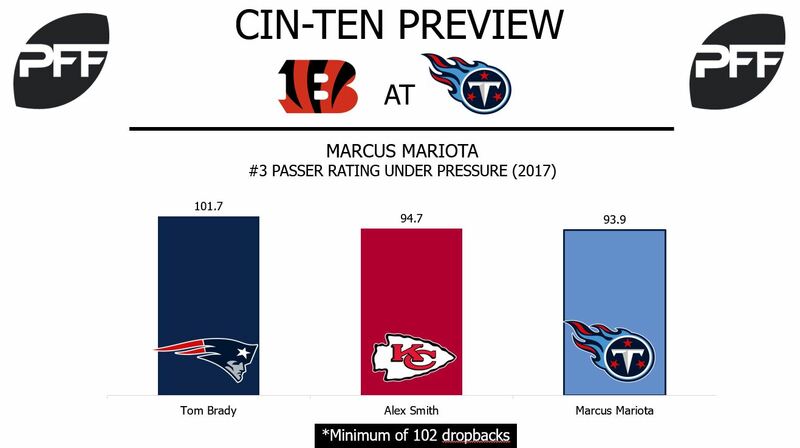 QB Marcus Mariota vs. Bengals pass rush – Mariota has faced pressure on only 21.4 percent of dropbacks this season, which is the lowest rate among 32 quarterbacks with at least 187 dropbacks. Even when he’s faced pressure, Mariota has flourished. His 93.9 passer rating when throwing under pressure ranks third. The Bengals have thrived rushing the passer, despite sending a blitz on only 16.4 percent of pass snaps. They’ve registered 110 of their 140 total pressures with four rushers or less. Mariota has completed 65.3 percent of his passes for 1,086 yards, four touchdowns and three interceptions when he hasn’t faced a blitz. 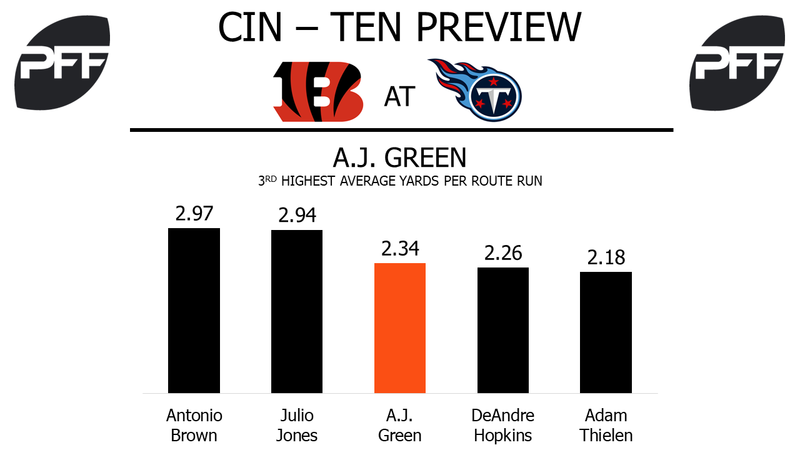 G Brian Schwenke vs. DI Geno Atkins – With Quinton Spain expected to miss Sunday’s matchup with turf toe, Schwenke will make his second straight start at left guard. Schwenke fared well in pass protection against the Ravens last week. He earned a pass-block grade of 83.6 and didn’t allow a quarterback pressure. He struggled in the run game, however, earning a run-block grade of 44.5. This week, he’ll often see Atkins lined up across from him. Atkins ranks 10th among defensive interior linemen with a run-stop percentage of 11.1. In addition, he ranks second in the group with a pass-rushing productivity of 12.7. TE Delanie Walker vs. S Josh Shaw – Walker ranks second among tight ends with a PFF overall grade of 85.1. He averages 1.90 receiving yards per route run, which is the ninth-highest rate for a tight end that’s seen a minimum of 25 targets. Walker is often utilized out of the slot, where he’s run 51 percent of his routes and received 22.6 percent of his targets. Shaw has given up eight catches on 12 passes into his coverage for 108 yards and a touchdown. He’s lined up in the slot on 29.8 percent of his snaps, which is more than any other Bengals safety. He’s allowed a passer rating of 113.7 when in slot coverage.